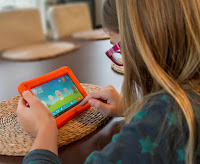 Playaway Launchpads are pre-loaded learning tablets created just for children by Findaway. Inc. Aimed at children 3-5 years old, each Launchpad tablet contains several apps on a specific theme – numbers, letters, transportation, and more. Roselle Library card holders can check out a Launchpad tablet for a week to explore and discover the various apps. See what's available and place a hold on a LaunchPad today! Roselle Public Library is located at 40 South Park Street, Roselle, IL. For more information, call the Youth Services “Ask Me” Desk (630) 529-1641, x*351.